Media captionWhat is it like to work as a falconer? The amount spent on ridding streets of pigeons and gulls has almost doubled in the past three years, it has emerged. About two-thirds of England's councils responded to a BBC information request on bird control. Their responses reveal the amount spent rose from £452,000 in 2013-2014 to £830,000 in 2015-2016. The British Pest Control Association said the increase in spending might reflect a growing awareness of public health risks posed by some birds. The figures come about two years after then Prime Minister David Cameron called for a "big conversation" about gulls in the wake of attacks on a dog and a tortoise in Cornwall. Of the 103 authorities that specified the types of control methods used, 12 said they employed marksmen to shoot pigeons, 12 used hawks and 46 used spikes to discourage pigeons landing. Scottish councils spent £950,000 over the past three years compared with £43,000 in Wales and £9,519 in Northern Ireland. The biggest spender on bird control is the London Borough of Southwark, which has shelled out £393,000 since 2013. Stoke-on-Trent City Council had the biggest spend outside of London, with £75,000 since 2013, followed by West Sussex County Council which spent £65,000 and Portsmouth, which spent £63,000. Money spent by councils on bird control ranges from approaches such as pigeon-proofing buildings to clearing up pigeon guano and removing dead pigeons. But some types of bird control - such as pigeon-proofing - simply move "problems on" to another building or area, said Dee Ward-Thompson, technical manager at the British Pest Control Association. "If you totally exclude them rather than control the population, they sometimes just move to an adjacent building. "What we are seeing more often now is landowners coming together to deal with issues collectively. "In London, they are trying to exclude gulls from all of the buildings because otherwise they will just be moving the issue on." Pigeon control was usually carried out on public health grounds, she said, while gulls were targeted by some authorities because they can be aggressive. Ms Ward-Thompson, who said bird control activities must be carried out by professionals because of the various laws involved in protecting animals, said she was unaware of a growing issue with birds that could explain the doubling in spending over three years. 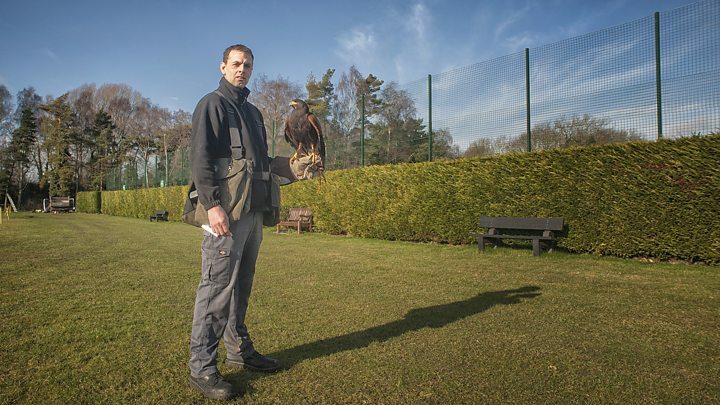 Falconer Mark White, of East Anglia-based Step Pest Control, said councils were increasingly using non-lethal methods of bird control. He uses a combination of methods ranging from netting and spikes to special gels which look like fire, hawks and even a high-powered laser beam. "A lot of people think we in pest control use hawks for killing. It is in fact the complete opposite - we use the birds for disruption and discourage killing as much as possible." The Royal Society for the Protection of Birds said it "would always advocate non-lethal measures in the first instance". The RSPCA said: "The most humane way of deterring birds is to remove what attracts them to urban areas - mainly food or shelter. "Means of doing this can include reducing food availability, or preventing them from accessing roofs or other areas where they could cause disturbance. "If deterrence methods and all alternatives fail, and there is a proven case for control methods, we urge people to use only humane methods and trained, experienced professionals." Video Have seagull attacks left the birds misunderstood?